Halifax could give a second debut to the former Warrington star Simon Grix in Saturday night’s Championship showdown at Whitehaven (6.30). 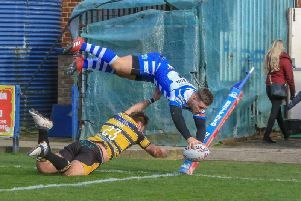 Halifax-born Grix, who played for Fax as a teenager before spending a decade with the Wolves, has not laced a boot in anger since the end of the 2014 season, when he suffered a career threatening leg fracture playing for the Cheshire side. He returned to his hometown club over the winter, but his expected comeback was delayed after he was given an effective leave of absence for family reasons. Coach Richard Marshall revealed last week Grix, who would offer options at half back, back row and centre, was back in training and is firmly in contention to play against the Cumbrians after being named in a 19-man squad. “This might be the week we get Simon involved,” confirmed Marshall, who still has injury doubts over captain Scott Murrell, centre Ben Heaton and winger James Saltonstall. “He trained Tuesday and came through okay so we’re hopeful at this stage. “If he does play, he’ll probably start on the bench and there’s no expectations on him. “He’s not played for the best part of two years, so he’s an unknown quantity, both for us and the opposition. “He’s looked good in training though, really classy. “He’s still pretty sore afterwards, but that recovery time will come down as his body adapts. “I think he’s pretty apprehensive, which is normal, but I hope he will be pleasantly surprised. Of the injured players, Saltonstall looks the least likely to recover after suffering what Marshall described as a “tweak” of his hamstring in the 60-22 walloping of Sheffield, with his potential absence bringing Jake Eccleston and Gareth Potts into the frame. “We’ll see how they all come through, but we won’t take any risks with any of them,” said Marshall, who expects his team’s new-found form to be challenged by a Haven team who pushed league leaders Leigh close last weekend. “Whitehaven are a good side, a much better side than they were when we played them on the opening day of the season. “They gave Leigh a real go last weekend; it was 12-12 at half time and, if I’m honest, I thought they were a bit unlucky to have a couple of things go against them in that second half. “We just need to go up there and get the job done. “It’s never an easy place to go and play and there won’t be any airs and graces this weekend.